"The Earth Has Become Heaven Today"
8 Year Old Chants "It Is the Day of Resurrection"
Saint Germanos was born in Constantinople around 640 and was the son of the patrician Justinian. 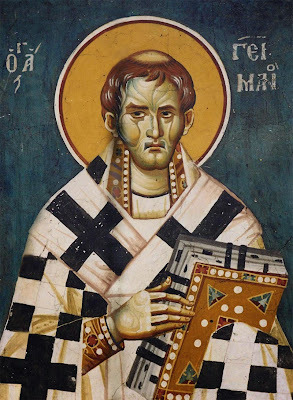 At the age of twenty he was orphaned, when his father was executed by Emperor Constantine IV the Pogonatos (668–685), because he was considered to be involved in the murder of his father Constans II. Germanos, after being castrated, was placed among the clergy of the Great Church. He served with zeal in the study of the sacred letters, became deeply knowledgeable of them, and was distinguished for his holiness of life and his virtue. After visiting Jerusalem and worshipping at the sacred sites of the Holy Land, he returned to Constantinople and was ordained a priest. In 709 he was elected by Patriarch Cyrus to be the Bishop of Kyzikos. From this high position he fought strongly against the heresy of the Monothelites. When Patriarch Cyrus was deposed and his successor John VI died, he was chosen with the praise of Emperor Anastasios to be the Patriarch of Constantinople on August 9, 715. When the Saint became Patriarch, he devoted all his spiritual and moral strength to the ministry of his flock, teaching and nourishing them with inspired sermons. In 718, he helped Constantinople be rescued from invading barbarians, and afterwards the Akathist Hymn was chanted to the Theotokos, to honor her for saving the City. When the iconoclast emperor Leo III the Isaurion (717–741) ascended the throne, he pressed Patriarch Germanos to help him so that iconoclasm would prevail. Not only did he refuse, but he rebuked Leo for his unholy acts, and he urged the people to resist iconoclasm. Seeing that nothing succeeded, Emperor Leo through a coup forced the Saint to abandon his throne. Thus, on 6 January 730, after placing his omophorion on the Holy Altar of the palace, he retired to his paternal house in Platani, where he lived in asceticism and composed hymns till his repose in 733. Though originally deposed and anathemitized by the pseudo-Synod of Hieria in 754, he was vindicated and praised by the Seventh Ecumenical Synod in 787, which condemned iconoclasm and restored the holy icons. Saint Germanos bequeathed remarkable hymnography and other writings, but unfortunately most of his works were burned by Leo III. Preserved were 104 Stichera and 22 Canons from among his hymns. Among his writings are the following: a) "On Heresies and Synods"; b) "Three Dogmatic Epistles on the Iconoclasts" (to Bishop John of Synada, Bishop Constantine of Nakaleia and Bishop Thomas of Claudioupolis); c) "Eight Discourses" (two on the veneration of the Holy Cross - one for the Third Sunday of Great Lent and one for Holy Saturday -, two for the Entrance of the Theotokos, three for the Dormition of the Theotokos, and one for the Annunciation of the Theotokos); d) "Homilies" (at the inauguration of the Church of the Theotokos and the holy infancy of our Lord Jesus Christ). 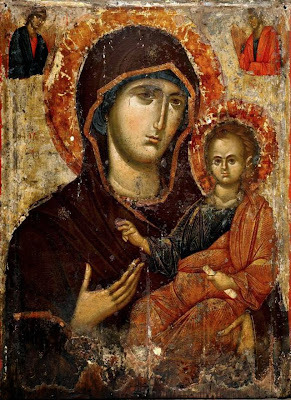 The Wonderworking Icon of the Mother of God of Lydda or "the Roman"
The wonderworking icon of the Mother of God of Lydda or "the Roman" is also called Lidianca and Romana, indicating the places associated with the holy icon. Arriving at Lydda, they found an icon of the Mother of God imprinted in color on the wall of the church (some sources say the image was on a pillar). Then the Mother of God appeared and rejoiced at the number of people who had gathered there. She blessed the icon and gave it the power to work miracles. This icon was not made by the hand of man, but by a divine power. In the eighth century, Saint Germanos, the future Patriarch of Constantinople, passed through Lydda during his pilgrimage to the Holy Land. He had a copy of the icon made, and on the back of the icon he had an icon of Saint George made (who was from Lydda). This icon he had with him during his Patriarchate, and when he was forced to abandon his throne he took it with him. Towards the end of his life, in 733, he sent the icon to Rome during the iconoclastic controversy, and with it a letter addressed to Pope Gregory III mentioning iconoclasm as the reason for the gift. It is said that the icon arrived by itself in a miraculous manner to Rome. It was received by the Pope, the letter was read, it was placed in the Church of Saint Peter, and was the source of many healings. During the reign of Emperor Michael III and his mother Saint Theodora the Augusta, who restored the icons, and when Sergius II was Pope, in 842, the reproduction returned to Constantinople and was known as the Roman Icon. 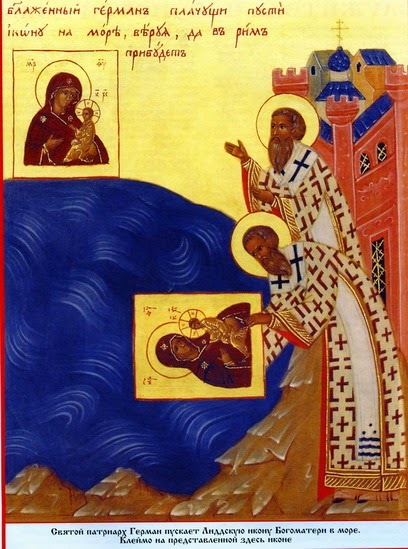 This took place in the following manner: The icon would move and stand upright on its own, primarily during Matins and Vespers, and sometimes during the Divine Liturgy. Once the icon hovered over the heads of the faithful, as if held by angels, and slowly left the church, arriving in Constantinople the next day. Saint Theodora placed it in the Church of Chalkoprateia. The holy icon known as "the Roman" was celebrated at that time by the faithful on September 8th. The icon remained in Constantinople until the fifteenth century. 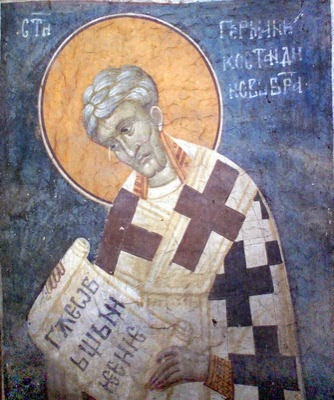 On March 31, 1401 Emperor John VII the Palaiologos sent it as a gift to the Moldavian ruler Alexander the Good, thus sealing the reconciliation between the Ecumenical Patriarchate and Moldovia. Initially the icon was placed in Mirauti Suceava, and later the son of Alexander the Good, Stephen II, gave it as a gift to Neamt Monastery. 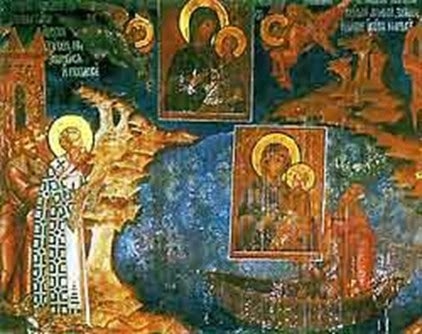 Although the icon has passed through many adventures, at one point it was buried to protect it from the Turks, and the icon remained in very good condition. The icon also bears the name "Proskynitria" or "the Venerated", because many times the icon would leave the hands of the bishops and priests holding it and it would hover in the air. It therefore took this name because when this would take place the people would kneel down to venerate it. The icon is celebrated on June 26th.